In modern gas turbine engines, one of the most common methods used to cool components is to employ a double-wall cooling configuration. This method, typically used for turbine vane and blade cooling, utilizes a combination of impinging jets, through-wall flow, and film cooling to reduce metal temperatures to acceptable levels. Because of the complex nature of these flows, they are susceptible to particulate deposition that reduces the cooling effectiveness of the coolant flow, potentially leading to part failure. 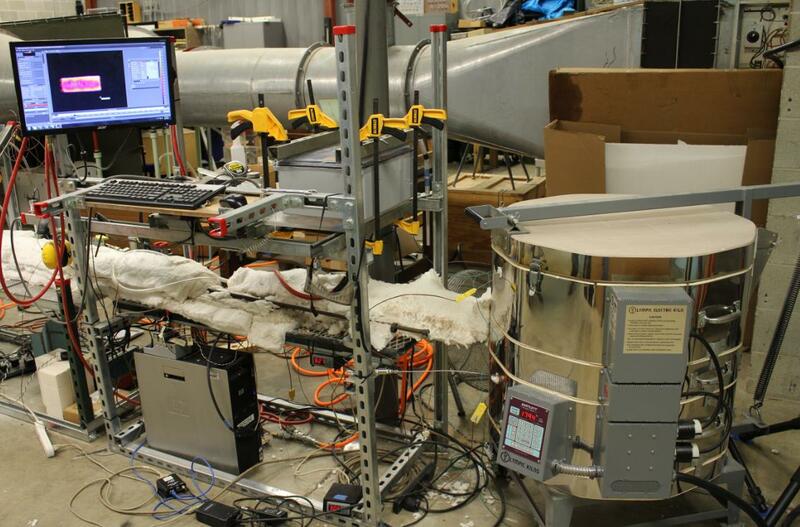 At the Turbine Aerothermal Laboratory, a simplified double-wall test article (shown below) is used to evaluate the effects of numerous parameters on the buildup of particulate and subsequent flow blockage development. Heated flow can be supplied to the test article, which can be placed inside an electric kiln to generate representative metal temperatures. Particulate is delivered to the article via a conveyor system, allowing for precise control over the rate of particle injection. A schematic and digital image of the internal deposition testing facility is shown below. The test section portion is modular, allowing for various other cooling geometries to be studied such as effusion cooling common in combustor liners. The flow can be heated either with the use of an in-line heater or by utilizing electric heating tape wraps depending upon the desired temperature range for a given experiment.